Luis Garcia attended the University of Miami from 1969 to 1971, during that span the Huricanes men's tennis team compiled a 53-3-1 record. Garcia was known for his quickness and court coverage, Garcia was equally as successful in singles as we was with doubles, but it was when he was paired with Pat Cramer that he reached the peak of his collegiate career. The UM duo defeated Roscoe Tanner and Rob Rippen of Stanford to capture the 1970 NCAA doubles crown. That finish is the highest-ever accomplishmentfor the UM men's tennis program. 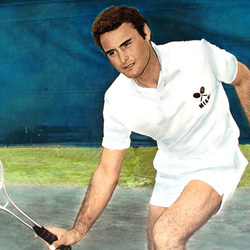 Upon winning the 1970 doubles title, Garcia was awarded the college tennis' most coveted prize-the Raphael Osuna trophy, given for tennis excellence, sportsmanship and contribution to the game of tennis.